This poster advertizes the GUM (Gosudarstvenniy Universalniy Magazin) – the State Universal Store in Moscow. GUM was a common name for the biggest department stores in the Soviet Union. The GUM in Moscow is actually a shopping mall with unique architecture. Before the revolution the GUM building was known as the Upper Trading Rows. They were built in 1893 by Alexander Pomerantsev (responsible for architecture) and Vladimir Shukhov (responsible for engineering). Shukhov was an engineering genius – some compare him to Edison and Eifel. He developed practical calculations of stresses and deformations of beams, shells and membranes on elastic foundation, which allowed him to build the first Russian oil pipeline, various oil tanks and refineries. But he was most famous for his architectural projects including about 200 original towers (hyperboloid towers) all over the world, the most famous being the 160-meter-high Shukhov Tower in Moscow (1922); about 500 bridges; the Kievskiy Railway Station in Moscow (1912-17); several constructivist projects, designed in collaboration with another world-renown architect Konstantin Melnikov, notably the Bakhmetevsky Bus Garage (1926-28) and Novo-Ryazanskaya Street Garage (1926-29). The Upper Trading Rows received Sukhov’s trade-mark feature – the giant glass-roof. This is a firm construction made of over 819 tons of metal with a diameter of over 14 meters. Illumination is provided by huge arched skylights of iron and glass, each weighing some 820 tons and containing in excess of 20,000 panes of glass. In 1928 Stalin turned the store into office building but right after his death in 1953 the building’s original function was restored. During the soviet times it was one of the main sources for consumer goods with queues long enough to quit the building and reach the Red Square. All visitors from all over the country had the same list of Moscow places of interest – the Mausoleum, the Bolshoi (the big) Theatre and the GUM. First thing - where do you get all these posters and information from? 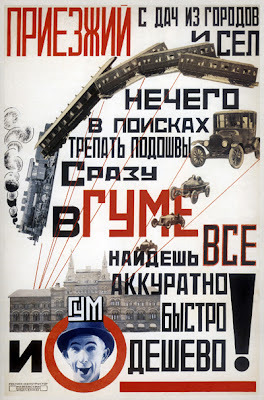 And secondly - is there a tradition of constructivist posters? I've only heard of monument blueprints so I'd like to know what else they were involved with. Thanks! well... The information comes from different sources - my head mainly ;) What do you mean by tradition of constructivist posters and what is a monument blueprint? I did not quite get it. In my first semester studying Russian in college, I was introduced to the GUM and its significance to Muscovites. Last summer, I did the Google Earth Tour of Red Square, it's a beautiful building and I think that this poster is available as a reprint. If I remember correctly, there used to be a GUM store in East Berlin, before the wall came down. When I saw it, I was struck by the oddity of the name and wondered its origin. Now I know. This is a great poster, by the way. Great site. It's on my blogroll. Thank you thank you thank youuuuuu!